Wix Vs Squarespace – Better Website Builder? Setting up a website is now something that can be done by literally anyone. There are numerous tools and services that allow small business owners, bloggers, photographers, or anyone with a computer to quickly and easily set up an online website. Two of the most popular website builders are Wix and Squarespace. Today, we’ll go through both of these builders, explore their features, and compare them with each other in order to help you decide between the two. Wix was founded in 2006 and is based in Tel Aviv, Israel. According to Similarweb, it is ranked #4 in the Internet and Telecom > Web Hosting category. Signing up to Wix is fairly easy. After entering your email and creating a password (you can also sign up with Google or Facebook), you will be asked a few multiple-choice questions about the site you want to build (you can skip this part). You can then choose to use either the Wix editor to build a site yourself or have a professional design one for you (for a fee). If you choose the Wix editor, you will be presented with a number of design templates, based on the type of website you want to build. Preview and choose a template. The website builder and editor are pretty easy to use. It is a drag-and-drop editor, so you can resize sections and drag them around. On the right-hand side, you have a number of controls, such as copying and pasting, resizing elements, duplicating elements, repositioning elements, and so on. At the top, you have a number of tools and setting options for your site, such as adding a favicon, connecting Google Analytics, sharpening your images, editing the code, previewing and saving your site, and much more. 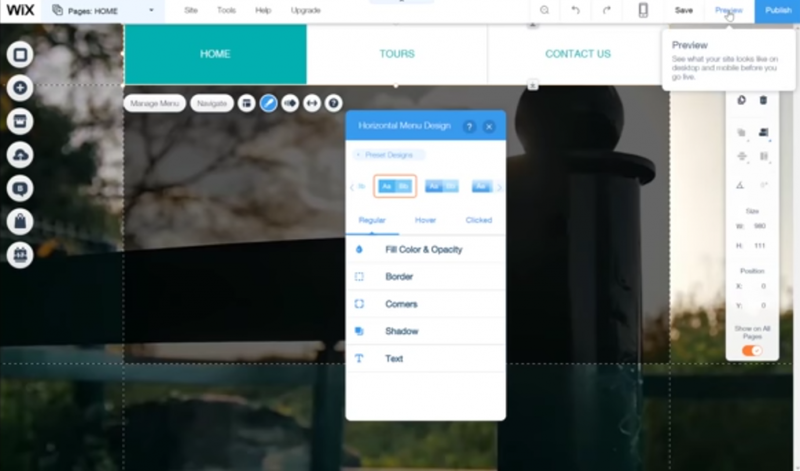 Wix has plenty of free and premium templates that you can choose from. There are themes and templates for all kinds of categories, industries, and website types (such as coming soon pages). You can host your site on a Wix domain if you want to stick with the free plan. 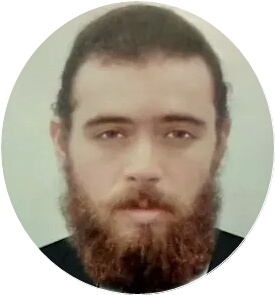 You can also purchase a domain from Wix or connect a domain that you purchased from a third-party site. If you upgrade your plan, you will get a free domain for the first year. If you have your own domain, you can get a business email as well. While Wix may not be the best option for setting up an ecommerce store, it is still possible. Wix has an ecommerce plan, which is $16.50/month. Besides letting you set up an online store, it will give you access to their ecommerce templates, which are designed for different industries. Another option is using an ecommerce app from the Wix app market. There are a few options, including some that have free plans. 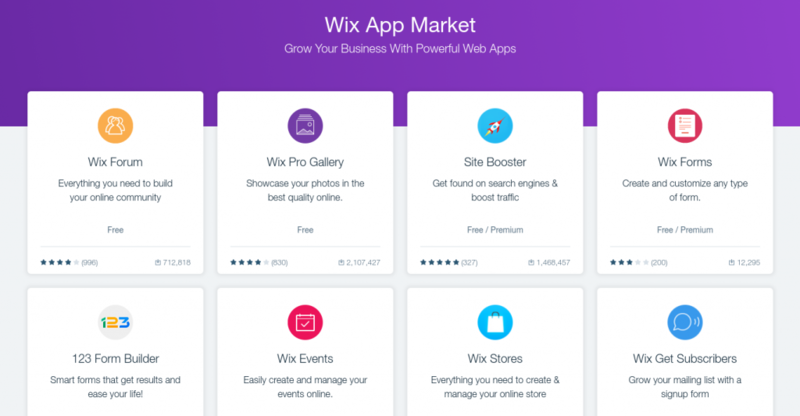 Wix has an app market with many free and premium apps. There are apps for all kinds of needs, such as marketing, design, payments, and lead collection. Wix also integrates with popular marketing tools such as Google Analytics, Facebook Pixel, Hello Bar, Crazy Egg, and more. Wix integrates with tracking tools such as Google Analytics, Google Tag Manager, Yandex, or a custom code from a third-party tracking tool. There are also a number of apps in the App Market that provide tracking reports. The Wix mobile app, available for Android and iPhone, lets you add blog posts, add apps, manage your online store, chat with your visitors or members, and more. Here is a full list of their features. Wix provides a number of customer support options. You can submit a ticket at any time for a response via email. You can chat with them live, call them on the phone, or get a callback during business hours. The great part about Wix is that it is free to use. If you want a basic site or blog, you can set one up without having to pay for hosting or even your own domain name. Squarespace is a smaller company than Wix, even though it was founded three years earlier in 2003. It is based in New York. According to SimilarWeb, it ranks as #7 for the category Internet and Telecom > Web Hosting. Squarespace also has a pretty simple signup process. As with Wix, you can answer a few questions or you can skip that and start browsing templates immediately. After you choose a template, you will be taken to the editor. The Squarespace editor is a bit less confusing than the Wix editor, which is great for beginners who have never built a website before. Each template will come with preconfigured blocks, such as the header, images, and so on. You can edit each block individually. Pages: Add, edit, and manage pages. Click on each page for its settings, such as its SEO tags. Design: Set your logo, title, style, and more. Commerce: Manage orders, inventory, customers, payments, discounts, and more. You’ll need to upgrade. on social media, and more. 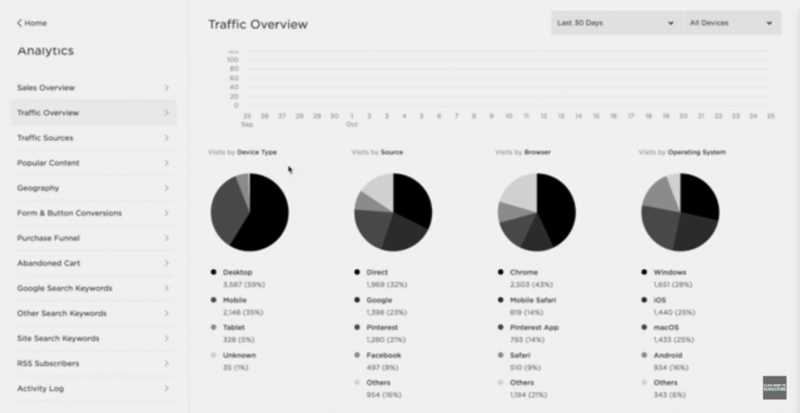 Analytics: View traffic, traffic sources, keywords, locations, and more. Settings: Site visibility, email, and more. Help: Access the knowledge base, videos, and webinars. It’s worth mentioning that under the Design option, you can choose to switch to a different template. You can do this even after your website is live without affecting your site details, which is something that is not available on Wix. Squarespace has a large library of templates you can use for any industry. Both Squarespace and WIx have a large selection of templates. Like Wix, Squarespace allows you to purchase and register domains. If you purchase an annual plan, you will get a free domain as well. If you already have a domain from a third-party source, you can connect it to your Squarespace account or transfer it if it is eligible. 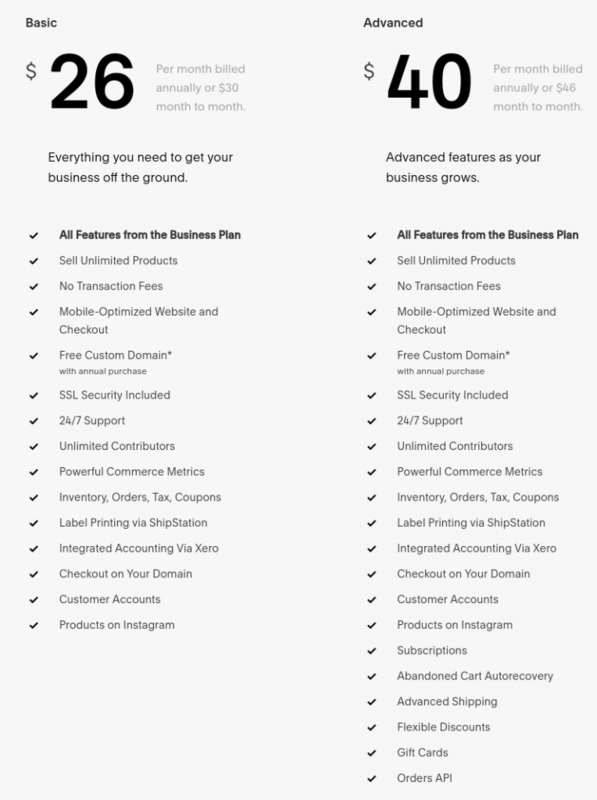 It is worth mentioning that domains at Squarespace start at $20/year, which is more expensive than most places. Squarespace has solutions for ecommerce businesses of any size. You can create an online catalog with an unlimited number of products or product variations. You can drag and drop your products and organize them based on tags or categories. You can also schedule when they go live or when they are taken down. You can add interactive images that can be zoomed into, as well as videos. 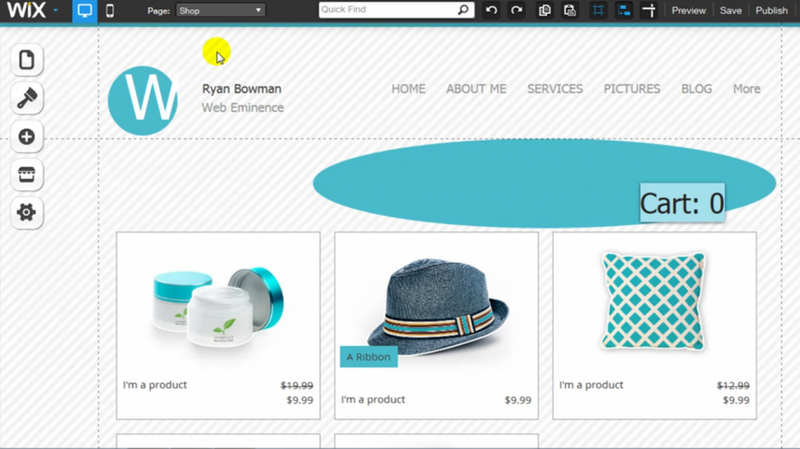 You can also add products to your blog posts or create a related products section. You can set up products that allow customers to subscribe to regular deliveries. If a customer abandons their cart, you can have reminder emails sent to them automatically. 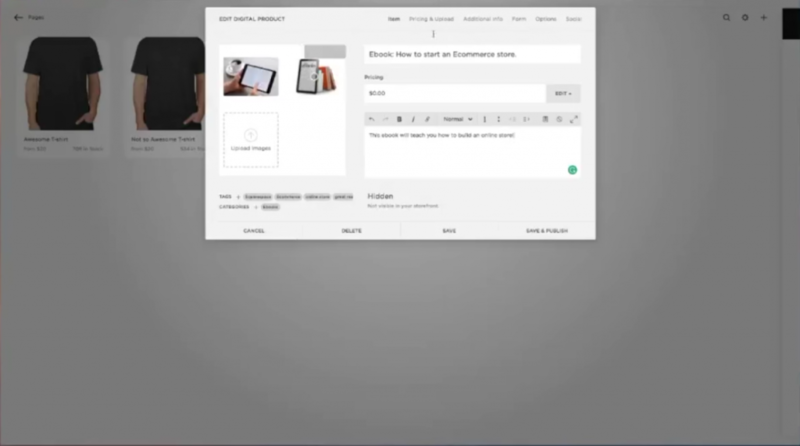 Squarespace uses Stripe for secure payment processing. You will automatically be able to accept credit cards, Paypal, and Apple Pay. There is a CRM dashboard for engaging with customers, as well as detailed analytics and reports. There is also an inventory management dashboard to help you manage your products and stock. Squarespace has detailed reporting and analytics for traffic, sales, geography, purchases, abandoned carts, traffic sources, keywords, activity logs, popular content, form conversions, button conversions, site searches, and more. However, the analytics that you have access to will depend on your plan. There is a Squarespace app available for iPhone devices. It allows you to edit basic site settings, edit and add blog posts, upload images, rearrange blog posts, and more. here are three ways to content Squarespace. Email support and Twitter support is available 24/7. Live chat is available during business hours. There is no phone support. Although Squarespace offers a 14-day trial without the need to enter your payment details, it is not free. There are two basic plans. The Personal plan is $12/month if billed annually or $16/month if billed monthly. The Business plan is $18/month if billed annually and $26/month if billed monthly. There are also two ecommerce plans for online stores. They are shown in the screenshot below. 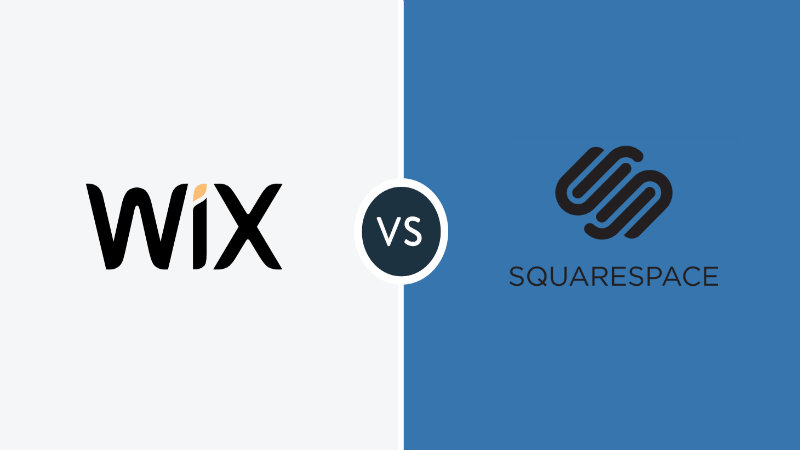 Wix Vs Squarespace – Which Is Better? 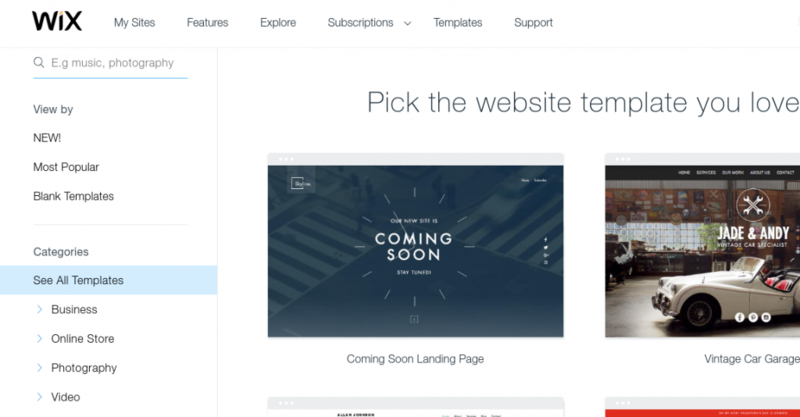 If you’re looking for a free website builder, Wix is the obvious choice. Many will find that their templates and website builder give you more flexibility. They also have more third-party app add-ons and better customer support. 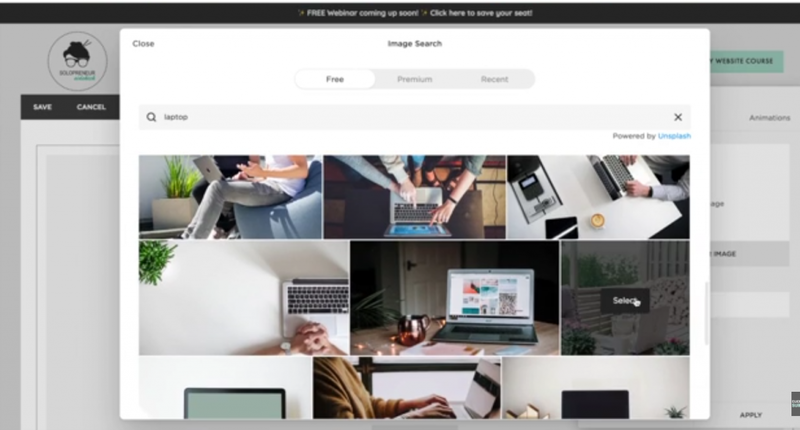 On the other hand, Squarespace does have some advantages over Wix, such as a simpler and easier-to-use website builder, the ability to switch templates, unlimited storage options, and better ecommerce plans.